There are 2 separate components to this automated optical equipment. The first component is the auto refraction. Auto refraction is a computer determined measurement of a person’s prescription. The prescription is not exact, but gives the doctor good baseline information or a starting point of the subjective refraction. It is of particular benefit for when dealing with non-communicative people such as young children or those with disabilities. 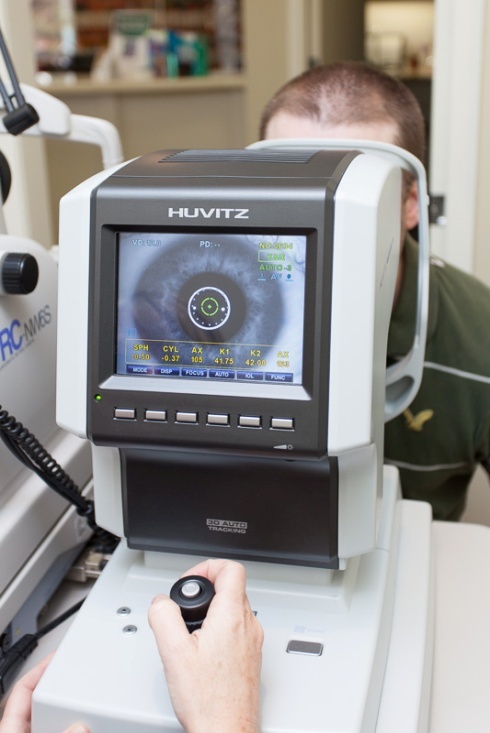 Auto refraction is a relatively quick and simple procedure. The patient sits behind the instrument and places their chin on the chin rest. They simply need to look into the instrument at a picture, which may go in and out of focus. Typically, three readings are taken and the instrument averages those readings. On an average person, the test takes 10-15 seconds to perform and no feedback is required by the patient. The second component is the auto keratometer. Auto keratometry is a computer determined measurement of the curvature of the cornea or shape of the front surface of the eye. It is used in optometric practice for contact lens fitting, detection of certain diseases (keratoconus) and as a component of determining laser eye surgery candidacy. The procedure is identical to that of auto refraction. In fact, the instrument at our office does both of these measurements simultaneously.